Paul Smith received his BA in Political Science and Master’s in Public Administration from Rutgers University-Camden. He is a Research Project Coordinator and has worked on a wide array of projects since 2007, including the City of Camden Capacity Building Project and the Evaluation of the State of New Jersey’s Workforce Development Services. 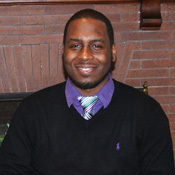 Currently, he is a researcher on the evaluation of the South Jersey Strengthening Families Initiative, and facilitates the Live Healthy Bridgeton Coalition, and the Cumberland County Positive Youth Development Coalition’s Vineland Working Group. Also, Mr. Smith is coordinating the development and updating of WRI’s South Jersey Data Profiles. Mr. Smith’s other areas of interest include economic and urban development, housing policy and government reform as it relates to service delivery. Page last updated by Senator Walter Rand Institute for Public Affairs at 3:24 pm October 5, 2018 . This page was printed from http://rand.camden.rutgers.edu/paul-smith-mpa/ at 8:21 PM Saturday, April 20, 2019.